A number 1 single. Another single which entered the top 10 this week. A top 5 album. 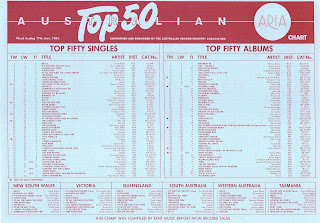 The Footloose soundtrack was an unstoppable force on the ARIA chart. Until it wasn't. This week in 1984, the film's third single entered the top 50 but wouldn't breach the top 40, while two more tracks from the movie debuted on the top 100, destined never to make it to the top 50. The song that knocked "Footloose" off the top of the singles chart remained at number 1 again this week in 1984. 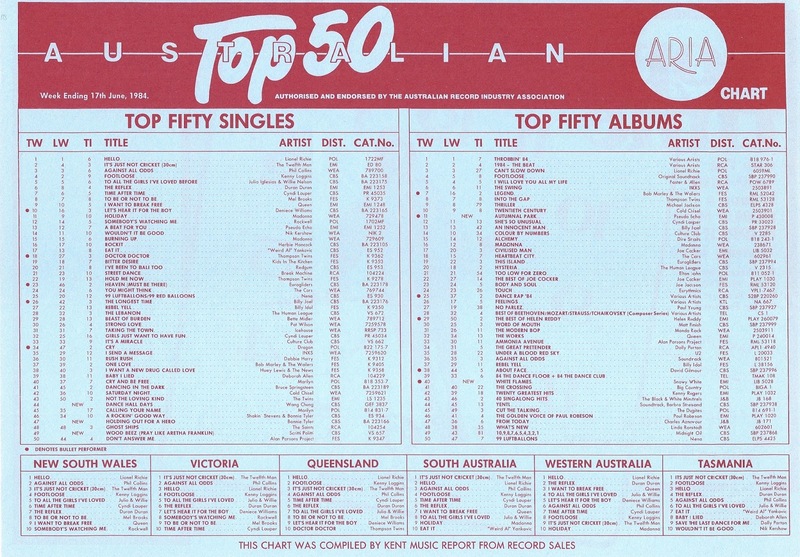 "Hello" by Lionel Richie spent a second week as Australia's biggest single. Two years earlier, they'd topped the chart with "What About Me", but this Footloose track, which wasn't released as a single in the US, couldn't turn Moving Pictures declining chart fortunes around. Two months earlier, they'd topped the chart with "99 Luftballons/99 Red Balloons" but this peppy follow-up by German band Nena faltered, resulting in them becoming a one-hit wonder. Another new entry from Footloose (not that you'd know it from the video) was the first single by the post-Jody Watley (and Jeffery Daniel) line-up of Shalamar. "Dancing In The Sheets" was a US top 20 hit. Scritti Politti's second album, Cupid & Psyche 85, was still a year away, but with "Wood Beez (Pray Like Aretha Franklin)", frontman Green Gartside (real name: Paul Strohmeyer) gave an indication of the new direction his band would take. And it was his band, with the former line-up responsible for 1982's debut album, Something To Remember, having been disbanded as a result of Green's desire for a more mainstream, major label approach. A slick blend of synthpop and funk that referenced Aretha Franklin's "I Say A Little Prayer", "Wood Beez..." gave Scritti Politti their first UK top 10 single and their only Australian top 50 hit, but even better music was still to come - including big US hit "Perfect Way" and 1988's "First Boy In This Town (Lovesick)". 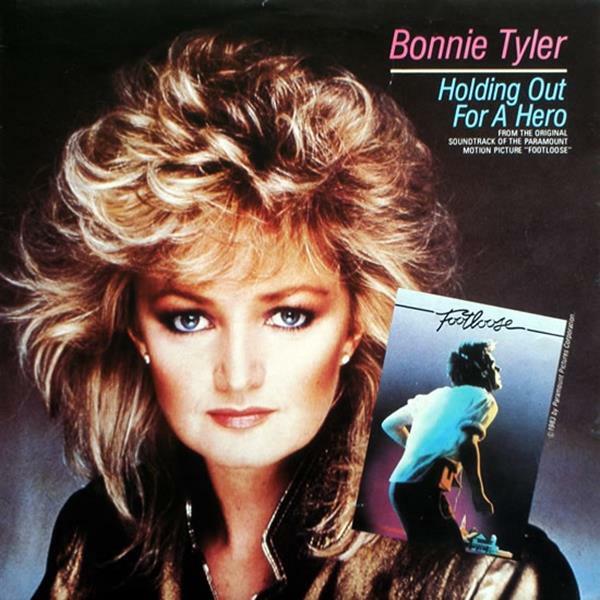 Jumping 50 places this week, "Holding Out For A Hero" looked like it was going to become the third high-flying hit from Footloose, but it quickly ground to a halt, spending the next three weeks at 47-44-44, before falling out of the top 50. The melodramatic song courtesy of - who else? - songwriter and producer Jim Steinman (who was behind "Total Eclipse Of The Heart") is more memorable than its lowly chart performance would suggest. Not only did "Holding..." play during Footloose's pivotal tractor chicken scene, but it has been used countless times in the decades since in TV shows, movies and ads. When approached by the movie's screenwriter and soundtrack co-writer, Dean Pitchford, to write the song for Bonnie, Jim lifted the opening riff from his own track "Stark Raving Love", which had appeared on his 1981 album, Bad For Good, and incorporated it into "Holding...". We'd see Bonnie on the top 100 just one more time after this, with 1986's "If You Were A Woman (And I Was A Man)", which itself was recycled later that year for Bon Jovi. Because I've already covered the ARIA charts from 1986, I delved into the background of Wang Chung previously, but it was this week in 1984 that the British band landed their first hit with "Dance Hall Days". A track they'd recorded in 1982 in their previous guise as Huang Chung, the song was reworked for their first album as Wang Chung, Points On The Curve, and this time became a worldwide hit. Two videos were made for "Dance Hall Days" - the one below, directed by Derek Jarman, and another you can check out here. The song's inspiration came from the dance hall band that singer Jack Hues' father used to play in - and which Jack himself played for when he was starting out. Next week: one of music's most reliable hit-makers returns with one of his biggest singles of the '80s. Plus, another British male artist scores his first top 50 single. It's hard to believe that 'Holding Out for a Hero' flopped locally. Didn't flop out in Shrek though haha. Thanks to the cover version in the movie, it's quite a well known hit.